WE ARE YOUR LOCAL REPLACEMENT SPECIALISTS! At Deml Heating & Air Conditioning we offer Installation, Replacement, Repair and Service of HVAC products and equipment for both residential and light commercial customers. Whether you need service on your furnace, air conditioner, or another IAQ system in your home, give us a call. We're a company that takes care of all your home comfort and indoor air quality needs. We believe in providing our customers with the best service available. We don't take shortcuts that could cost you in the long run. We have always operated under a simple belief: We service what we sell. This means we are factory trained and have continuous updated information on the maintenance & service of any system that we have installed. We are a NATE Quality Circle Company. This means that our Technicians are NATE Certified. 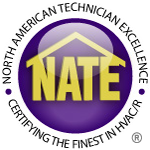 NATE-certified technicians are skilled professionals who have proven their knowledge in the HVAC industry by passing specialized NATE certification tests. When you sign up for our Planned Maintenance Service, you are assuring that your system is in working order before the heating or cooling season kicks in. Like a car, well maintained equipment runs better and lasts longer. Spring, Fall or Combined Spring/Fall Plans are available. Our professional service technician cleans and checks the equipment and changes your filter.